The purpose of the Ojai Chautauqua is to engage Ventura County in civil discourse about controversial and highly passionate subjects. The Chautauqua was an adult education movement in the United States, highly popular in the late 19th and early 20th centuries. Chautauqua assemblies expanded and spread throughout rural America until the mid-1920s. The Chautauqua brought entertainment and culture for the whole community, with speakers, teachers, musicians, entertainers, preachers, and specialists of the day. Former U.S. President Theodore Roosevelt was quoted as saying that Chautauqua is “the most American thing in America.” The Ojai Chautauqua is continuing this movement, with a special focus on encouraging civil discourse on controversial and highly passionate subjects. The feedback so far has been phenomenal. Civil discourse is dangerously absent from all aspects of contemporary life. The result of this failing is not only sad… it is dangerous. If we can develop this essential ability, we can begin to affect a positive change to many aspects of life that can extend far and wide. Download the handout that was on every chair at the event. This free event was made possible by individual donors, the Ojai Valley Chamber of Commerce, and the Ojai Valley Inn. In the face of an ongoing drought and a diminishing lake, the Ojai community has paid a lot of attention to water recently. Our government, environmental nonprofits, and water management agencies have also been working on the challenge of securing a sustainable water future for our valley. This Ojai Chautauqua will focus on the changes that are currently underway, as well as additional changes that we may need to consider. Over the next twelve months, the Ojai Chautauqua will produce up to five events focusing on issues particular to the Ojai Valley. With the success and impact of the November 19, 2017 event on Tourism in the Ojai Valley (watch it here) and the April 15, 2018 event on Water in the Ojai Valley (watch it here), our committee and sponsors realize that the greatest impact we can achieve is through this narrowed focus. The Ojai Valley is in a time of substantial transition and is striving to establish a sustainable vision for the future. The Ojai Chautauqua is pleased to work with non-profit and business groups, the City of Ojai, the public and private school systems, as well as educational institutions outside of the Ojai Valley to bring these communities together to build the momentum we need to become a model community that will inspire others to vibrancy. We are thrilled to offer our first free community seminar series, taking place at the Ojai Library from 12:00 – 1:00PM on the first and third Thursdays of each month, beginning May 3rd. Groups will be kept small (12-18 people) in order to facilitate conversation. Registrants are invited to attend as many sessions as they would like, and can begin at any time. Reservations are required and attendees read the scheduled material prior to attending each seminar. Click here to register. Download the first reading here – The Declaration of Independence. What are the fundamental principles of our Republic? Are these principles based on a view of objective reality/nature, or simply the “consent of the governed”? Are these principles changeable, and if so on what grounds? What authority is given to the Executive, Legislative, and Judiciary branches? What are rights? Are they based on nature or consent? Are they inalienable? We invite community members to join us as we discuss these founding and subsequent documents in an effort to better understand the principles of our ongoing American experiment. The Declaration of Independence, selected Federalist Papers, The U.S. Constitution, Dred Scott Decision and Dissenting View (edited), Lincoln Douglass Debates (edited), Letter from Birmingham Jail. On Sunday, April 15, 2018, at the Matilija Junior High Auditorium, we continued our discussion of Water: Part II. There was free admission thanks to private donations, the Ojai Valley Chamber of Commerce, and Oak Grove School. Download the Information Packet in PDF format. Click Here. In addition to our panels promoting civil discourse on topics of national concern, The Ojai Chautauqua is launching a series of events specifically focused on issues facing the Ojai Valley. We kick off this new series with an imminent and critical choice facing all of us – Water. In 2014 we held a panel on The Future of Water (view the event here) and since then the situation has only become worse with the continuing drought. There are several proposals under consideration and the purpose of this panel is to thoughtfully consider all of the options and their implications. We hope you will join us as we work together to ensure the vitality of this beautiful community. On every chair at the Panel on Ojai Tourism event – Sunday, November 19th, 2017, there was a handout containing data about Ojai tourism history, tax revenue, population, traffic, and housing. Click here to download in PDF format. It’s no secret: Ojai runs on tourism. It provides at least 30% of the city’s operating budget, and the industry provides far more jobs than any other in town. Longtime residents frequently bemoan the changes this influx of tourists has brought to the valley — even as merchants benefitted from the change. Epic battles over topics such as short-term rentals and funding for the Ojai Visitors Bureau have raged both in City Council chambers and on Facebook community pages. There’s no question that Ojai’s attempts to market itself in recent years have been effective. But why is tourism the driving force of Ojai’s economy? Is it good or bad for our community? Has it always been this way? Are there other options? And what did that Edward Drummond Libbey guy have to do with all of this? Caryn Bosson, Leslie Clark, Michael Haley, Johnny Johnston, Hallie Katz, and Dennis Rice. Tom Krause, President of the Ojai Chautauqua Committee, will be moderating. Misty Volaski, Kit Stoltz, Scott Eicher, Tim Dewar, Veronica Cole, Andrew Cantwell, Kimberly McLin, Bill Moses, Bret Bradigan, and Ulrich Brugger. 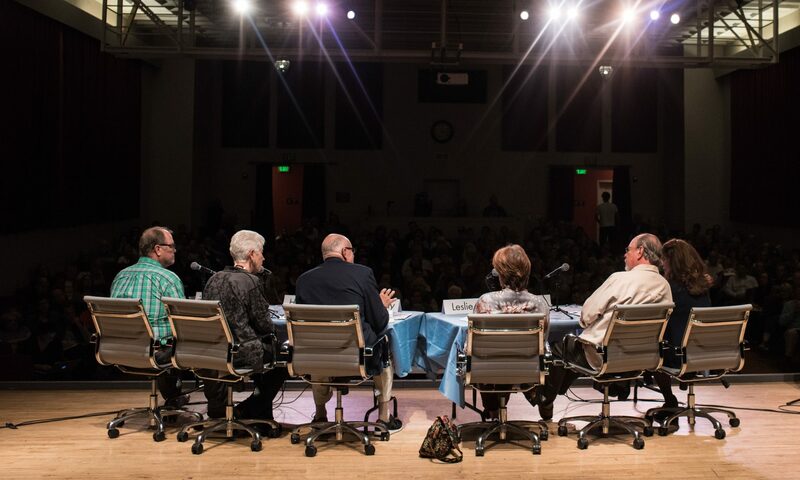 Since 2014 The Ojai Chautauqua has provided forums for intelligent and civil discussion. And this is only the beginning. Shakari Byerly – Managing Partner of EVITARUS, INC.
Caryn Bosson, Leslie Clark, Michael Haley, Johnny Johnston, Hallie Katz, and Dennis Rice. Moderator – Tom Krause. Misty Volaski, Kit Stoltz, Scott Eicher, Tim Dewer, Veronica Cole, Andrew Cantwell, Kimberly McLin, and Bill Moses. Watch the October 8, 2016, panel on the 2016 Presidential Election – Part Two – What Happens Next? Watch the September 17, 2016, panel on the 2016 Presidential Election – Part One – How Did We Get Here? Brian Calle – Opinion editor of the Los Angeles Daily News. Hiroshi Motomura – UCLA scholar of immigration and citizenship law.